On December 21, the film Bird Box starring Sandra Bullock was aired on Netflix and stirred up the internet completely. Based on a novel written by Josh Malerman in 2014, the screenwriter of Bird Box excellently presented a sense of thrill and fear throughout the whole movie. 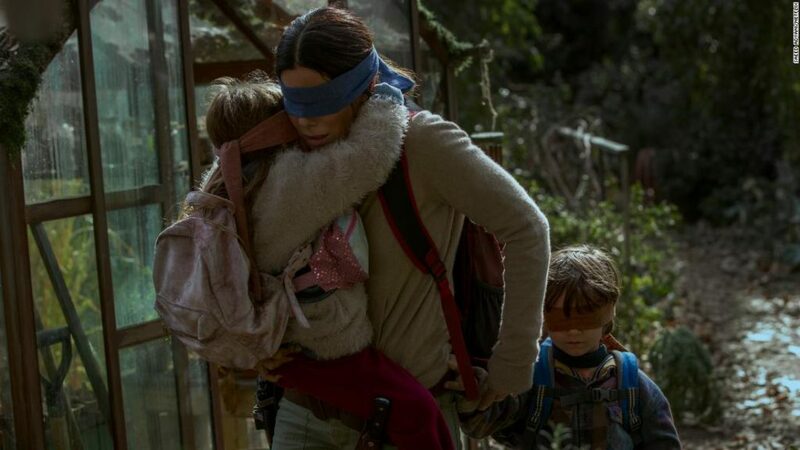 As of last week, it was reported that at least 45 million people have watched Bird Box since it came out, making it one of Netflix’s biggest hits to date. Sandra Bullock’s stellar performance as Malorie contributed greatly to the advancement of the plot. She played a pregnant woman who had a great fear of becoming a mother. Right at the start of the movie, it is revealed to the audience that an epidemic of mass suicides was spreading all through Europe and was predicted to hit the United States as well. As Malorie and her sister were on the road that same day, there was a sudden outburst of catastrophic car accidents and frantic people jumping in front of moving vehicles. It became obvious that the suicides had now gotten to California, and whatever was causing them was spreading very quickly. Upon noticing that she was pregnant, she was taken into a house with a group of other people who all shared a common interest: surviving. They all determined that whatever entity was causing the suicides could not be looked at, so whenever they had to make any contact with the outside world, they would all cover their eyes or put on a blindfold. Malorie befriended another pregnant woman named Olympia so neither of them would be alone through their labor. After several years, and several attempts at trying to live a somewhat normal life in hiding, the only survivors of the house were Malorie, Tom, and both Malorie and Olympia’s children. Trevante Rhodes, known as Tom in the movie, plays Malorie’s rescuer and later on her love interest. They became a family that supported each other until the children, Boy, and Girl, were about five years old. Their main priority was now to get to somewhere they could be safe and free of all fears. After a long 48 hour journey down a violent river, they arrived at a final destination where they were guaranteed safety. For the first time in nearly six years, Malorie was calm. It was then that she named her children— Olympia, “after the sweetest girl she had ever met,” and Tom after the man who became the love of her life. This Sci-Fi movie broke the internet the same week it came out. Now simply searching for the movie on social media can lead to one finding countless jokes, memes, and fans demanding a sequel. Overall, this movie had their viewers on the edge of their seats every minute of it. For its entirety of the two hours, it is guaranteed you will not be able to take your eyes off of the screen.